One of the biggest worries for people who put their belongings into self-storage is potential flood damage. Some people go to extreme lengths to prevent flood damage while others are, unfortunately, unaware of what can be done to prevent flood damage before it’s too late. If you are thinking about investing in a self-storage unit, or if you currently have items in a self-storage unit and you want to make sure you aren’t exposed to flood damage. 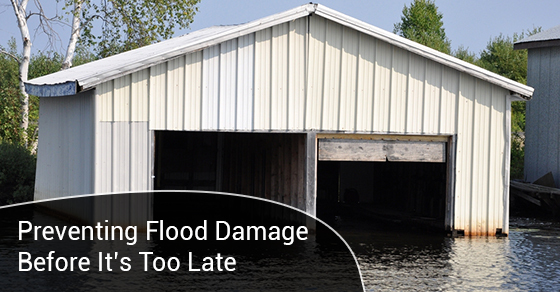 Below are some tips to help you prevent flood damage before it’s too late. If you live in a region of the country that is prone to water damage and flooding, one of the best precautionary measures you can take when setting up your self-storage unit, or even making changes to your current one, is to invest in plastic storage bins with a lid that can be sealed. Many people simply go with the inexpensive, more practical choice of cardboard boxes when storing their belongings into storage. While cardboard boxes are great for so many purposes, they don’t provide the best protection against potential water damage from flooding. If you want to give your precious belongings the best protection against water damage, invest in clear plastic storage bins. They also have an organization advantage with the fact that you’re able to see the contents of the bins without having to open everything up. Another great way to prevent flood damage is to utilize shelving to store your belongings at a relatively good height off the ground, above a level where flooding is likely to accumulate to. There are many great options out there when it comes to shelving for your storage unit such as rack and wall-mounted shelving, standing shelving, as well as hanging shelving are all options. Shelving is also great because it helps economize on space by utilizing the often underutilized vertical space in a unit. In addition to providing air circulation for the bigger items in your storage unit, pallets are another great way to get things up off the floor in the event of a flood. Pallets are the more economically sound choice for small businesses utilizing storage spaces for inventory or important documents because they are inexpensive, effective, and are highly durable. Sometimes the strength of a natural disaster is such that no amount of precautionary measures can truly protect everything you have in a self-storage unit. Think of some of the dangerous weather events which have hit the southern United States and the Caribbean over the last couple of years. Mother Nature can be so unpredictable. If you live in an area of the country where natural disasters are almost a guarantee, you might want to consider getting flood insurance for all of your important items in self-storage. Preventing flood damage before it happens starts with understanding these easy storage tips. Essentially, the goal is to store your items up off the ground and provide a barrier between the stored items and the water. It also means coming to grips with the fact that sometimes flooding is inevitable and having the necessary insurance policies will be the best protection against these unforeseen circumstances. For more information on self-storage spaces available in your area or to get help with flood protection in your storage space, contact Jiffy Self Storage at (416) 745-4339. Our professional staff will be happy to help you with all of your storage needs!